Extensive range of polythene rolls, including builders rolls, protective wide sheeting, poly tubing and polythene film. 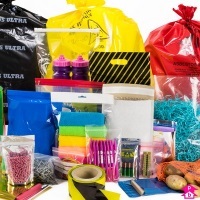 Available in clear, black or antistatic pink polythene, layflat tubing provides the perfect means of wrapping awkwardly-shaped items or making your own bespoke polythene bags. An essential tool of the building trade, builders rolls protect large surfaces areas and items of furniture during painting, decorating and other renovation work. Secure goods for transportation or storage with this huge range of shrink pallet covers available loose boxed or on the roll. We also stock shrink guns to seal the deal. 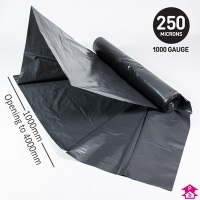 Available in black or blue, our damp proof membrane is made from 1,000-gauge recycled polythene and is BBA-approved to ensure the highest standards. Give any retail display some added sparkle with our fantastic range of crystal clear glossy display film. Seal your layflat tubing with ease using this fantastic range of manual heat sealers and make your own bespoke bags in no time at all. Polythene.ie is a dedicated website from Polybags.co.uk - the UK's number one polythene manufacturer - providing Irish customers with massive savings on a huge range of polythene packaging. We are very pleased to offer our Irish customers our usual great products at competitive prices, but today the savings to be made are even greater than ever. The weak value of Sterling versus the Euro means that Irish customers can afford even more great Polybags products than usual, whilst VAT-registered customers can get an extra 23% off every purchase with VAT at zero rate (0%). As if that wasn't enough, we also offer first class service, our famous no-quibble guarantee and fast, cheap two-day delivery - free on orders over £120 - meaning all of your polythene needs are covered. Welcome to Polythene.ie! Save 23% on everything with no VAT! If you are an Irish business customer registered for Value Added Tax (VAT), then every single purchase from Polybags comes with VAT at zero rate (0%) - which equals a 23% saving on the same products purchased in Ireland. To cash in on this VAT-busting deal, simply add your VAT number to the 'Additional Information' box in the checkout when making your first purchase. We'll then fully refund the VAT once verified, before setting you up with an account that means all subsequent orders will be automatically VAT-free. You can alternatively call our sales team on +44 20 8575 8200 and ask them to set you up with an online account. Once this is done, you can take advantage of VAT-free purchases by shopping online straight away. If you're an Irish customer but aren't VAT-registered, do not worry as there are still savings to be made. You'll have to pay UK VAT on your purchases, but at 20% that is less than Irish VAT (23%), so you'll still be saving with Polybags! 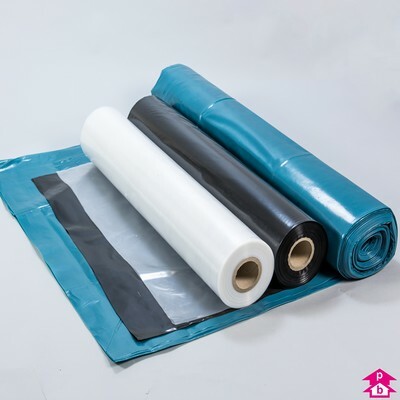 Whether you are shopping for polythene film on the roll or any of a huge range of polythene bags, then we've got you covered. Polybags are manufacturers, so we can cater for your every polythene packaging need, whether you require stocked products available ready off-the-shelf or bespoke products made-to-measure to suit your specific needs. 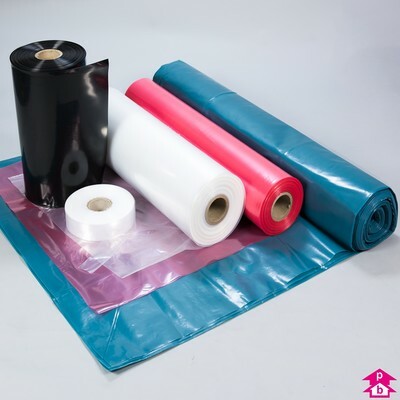 We have over a million polythene bags in stock, along with a fantastic selection of plastic sheeting, poly film and layflat tubing on the roll. 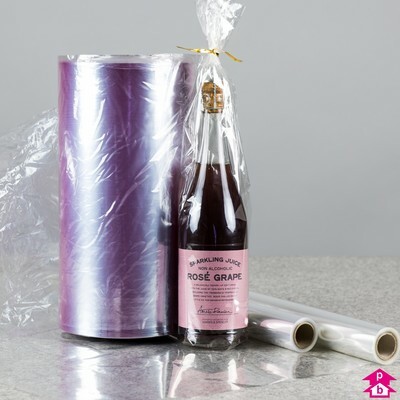 We can't list our full product range here, but below you'll find outlined a few of the main types of polythene film and tubing popular with Polybags customers. The term polythene rolls, or poly rolls for short, is used to describe a huge range of polythene film, tubing and sheeting on the roll - i.e. polythene wrapped around a cylindrical core that is dispensed by simply turning the roll and lifting the polythene. The term covers a range of plastics serving a variety of purposes, from high clarity polypropylene display film - used to make retail products sparkly - to thick damp proof membrane - as used to provide a damp course in the building industry. 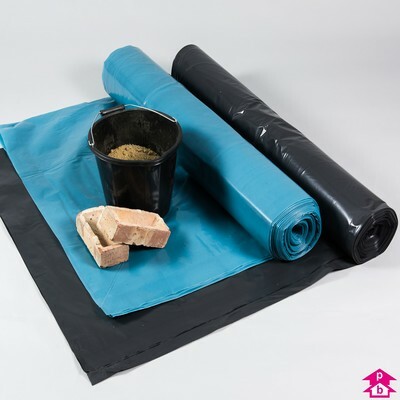 Often called builders rolls because of their popularity within the building trade, these sheets of polythene provide excellent protection for floors, surfaces and items of furniture during building and renovation work, such as painting and decorating. Sold on a 1m wide roll, builders rolls are available in clear or black sheeting and in medium or heavy duty options, folded either double or 4-fold across the roll. Extra thick polythene sheeting used in the construction industry to help keep moisture out of building interiors. Damp proof membrane, also known as DPM, is a membrane used as a crucial part of a damp proof course - a means of moisture control applied to floors and walls to keep moisture out of the building. Damp proof membranes are made from recycled black or blue polythene and have a minimum thickness of 1,000 gauge. All membranes sold by Polybags are approved by the British Board of Agreement (BBA) for quality control. Shrink covers are popular in the haulage industry for securing stacks of goods onto pallets to keep them stable during transportation or storage. Made from high-strength polythene, shrink covers are placed over the top of the goods and the pallet itself before a shrink gun is applied slowly across the whole surface of the cover. The heat from the shrink gun causes the polythene to contract, tighten and shrink tight, thus securing the contents to the pallet. Polypropylene film provides a crystal clear wrapping guaranteed to provide some added sparkle to retail products on display. Polypropylene is superior alternative to cellophane, as it provides higher clarity, greater strength and is cheaper. 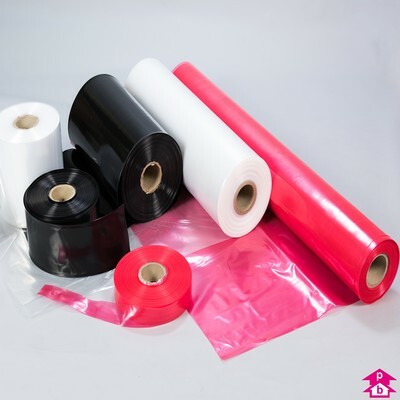 When sold on the roll, polypropylene display film provides a handy way to wrap items of different shapes and sizes, which you can fasten with ties, ribbons, staples or a heat sealer. 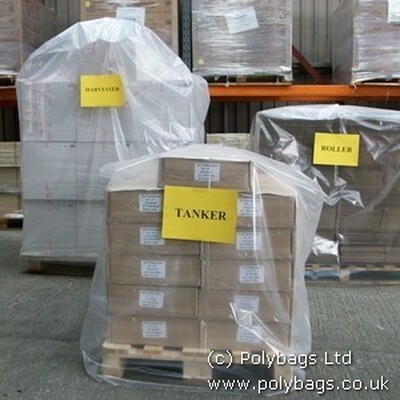 If you'd prefer to use bags rather than film, Polybags stocks a huge range of glossy display bags available off the shelf and ready to go at wholesale prices. Polythene tubing, also know as layflat tubing or poly tubing, provides a handy and economical way to package or enclose objects of a similar width but varying lengths, or difficult-to-bag items such as plants, posters and light tubes. Sold on the roll as per regular polythene film, layflat tubing is effectively a tube of polythene laid flat and wound around the core of a roll. To wrap a product, simply insert it into the tubing, unwind the roll and cut to the required length, before heat sealing or taping one or both ends to create your own bag, either sealed or open. Polybags stocks a huge range of layflat tubing in a variety of sizes, thicknesses and types of polythene, whilst we can also manufacture tubing to bespoke requirements. 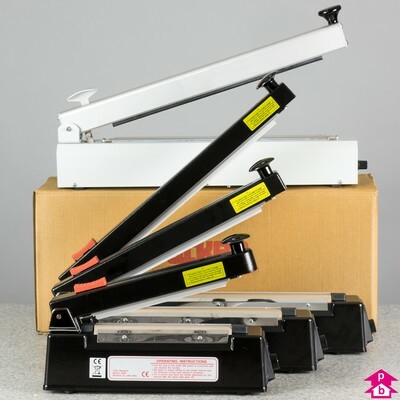 We also sell manually operated heat-sealers to permanently seal your wrapped goods. Low density polythene tubing - This film is made from 100% virgin low density polyethylene. The use of virgin polyethylene means it can be used for food packaging and service. Tubing can be heat sealed, stapled or taped at either one or both ends. Supplied on 12" diameter rolls (3" core). Pink anti-static poly tubing - Surface resistivity of 1012 ohms/sq.in. Amine-free, pink anti-static tubing (PAS, pictured below) is an excellent choice for protecting sensitive components from static discharge and is ideal for packing circuit boards, resistors and other electrical components. Supplied on 12" diameter rolls (3" core). Clean room tubing - Clean room tubing usually manufactured in a certified class 100 clean room. This stock clean polyethylene tubing is produced from barefoot resin that meets FDA &EFSA standards. It is wound on plastic cores and double bagged for added protection. 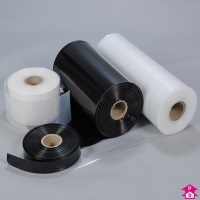 Black poly tubing - Produce tailor-made polythene bags to suit specific product requirements and keep your products concealed and confidential, using opaque black polythene layflat tubing. Autoclavable layflat polypropylene tubing - Heat-resistant material which emits less odor when autoclaving. High gloss, transparent tubing, ideal for medical, dental, lab, or food service implements. Meets FDA and European specifications for food contact. Polythene shrink film tubing - Inexpensive tubing which fits any shape. Simply insert item into tubing, heat seal ends and shrink with a heat gun. Protects from moisture, dirt, and tampering. Black conductive tubing - Blow extrusion, black volume conductive tube material is produced in 150m rolls in 400 gauge polythene as standard, although 300 and 600 gauge are available on special orders. Made using black carbon impregnated into film to create an extra strong static barrier, black conductive tubing is ideal for light-sensitive products and explosives. Meets Faraday Cage protection for electronic applications. UVI layflat tubing - Low density polythene with an added Ultra Violet Inhibitor (UVI) to extend life of the product in sunlight conditions. EVA layflat tubing - Ethylene Vinyl Acetate (EVA) tubing in which an EVA additive is added to strengthen and improve sealability. Appropriate for use in cold-temperature applications.